My oh my oh my these roasted spiral potatoes were good. And kinda pretty, too. But definitely delicious. 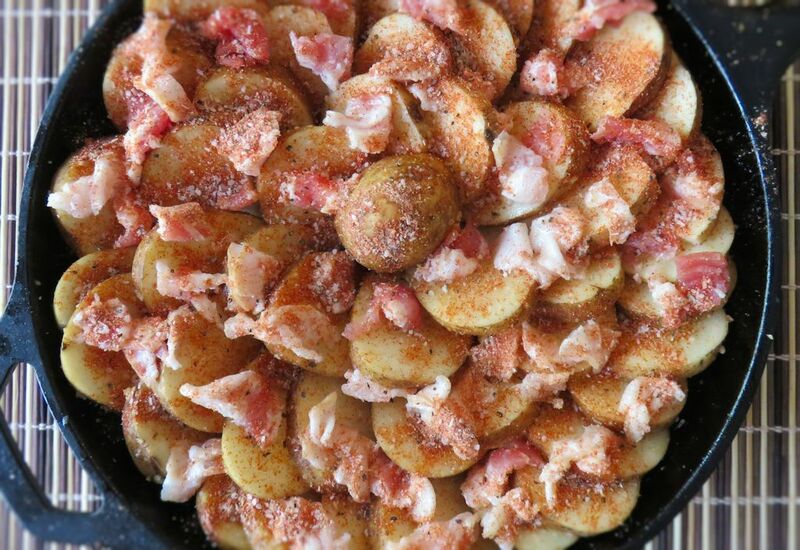 The potatoes get cooked up perfectly, mixed with smoky bacon, garlic and seasonings. As the potatoes near their journey to doneness they are then topped with butter and cheese. Oh yeah! Garnished with sour cream and green onions, this is one mighty fine side dish. Assembling the potatoes in the pan is the key to having them cook perfectly (and look cool). It’s easier than it looks. Just cut all of your potatoes the same thickness (it’s up to you if you want to leave the skin on or not). Then for each circular layer select pieces that are roughly the same size. You then just lay them into a lightly oiled cast iron skillet at a slight angle, overlapping by about half. You’ll need one hand to hold them in place and one hand to add potatoes. Once you’ve made the full circle they’ll stay in place. When the roasted spiral potatoes come out of the oven they are tender, covered in ooey gooey melted cheese. They look and smell out of this world. You’ll never want to cook potatoes any other way. Make sure you add a good bit of paprika to the spice mixture. It adds great color. These potatoes go great with a grilled steak. The perfect meat-and-potatoes dinner! Also try my melt-in-your mouth melting potatoes. 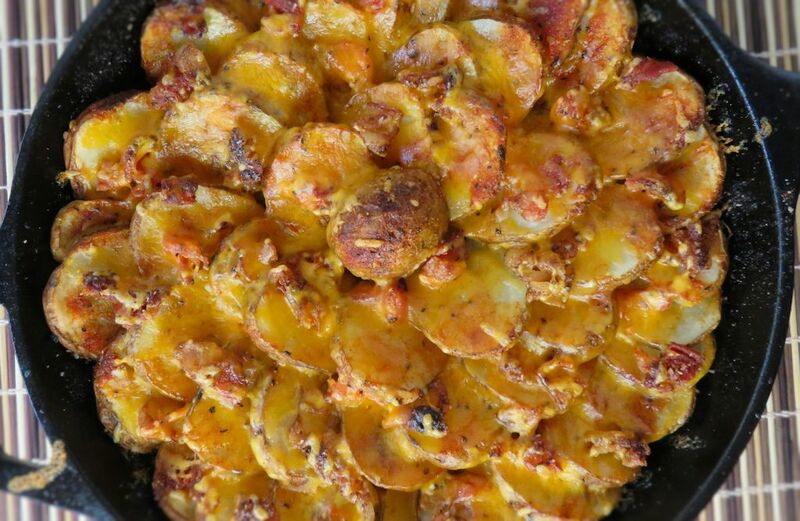 You'll need a cast iron skillet to make these roasted spiral potatoes. The larger the skillet, the more potatoes you will need. I used a 10" Lodge. Layer potatoes around the edge of the skillet. You'll want to select pieces that are roughly the same size. Over lap the potatoes by about half, using one hand to add potatoes while the other hand keeps the potatoes in place. You'll want them to be at about a 60 degree angle, slightly angled back, following the contour of the skillet. Once your first layer is done, add two more, each inside of the other. You might need four total layers depending on the size of your skillet and potatoes. When you get to the end you'll have a little round 'hole' in the middle. Place a potato end (point-side up) in that spot to complete the arrangement. Combine the seasonings and sprinkle over the tops of the potatoes. Don't be shy. Sprinkle the bacon pieces over the top and place in the oven for 45 minutes. Drizzle with the butter, raise the temperature to 425 F, and cook another 15 minutes. Sprinkle with the cheese and return to the oven for 5 minutes to melt the cheese. Serve garnished with sour cream and green onions. This entry was posted in Side Dishes & Salads and tagged recipe, Roasted Spiral Potatoes by Mike. Bookmark the permalink.